Discussion in 'Draft Games Forum' started by Invictus, Sep 21, 2018.
e.g. 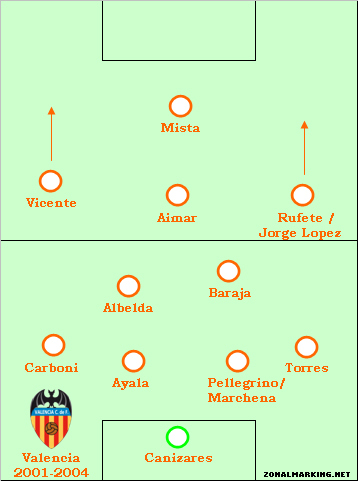 Simeone's Atlético are bloodhounds with incredible resolve and a formidable defensive ethos — how would you amplify the robust characteristics of the team without fundamentally altering the compact vertical shape, intense pressing with fairly rigid defensive blocks, or the individual and collective dynamics/hierarchies? Costa: Mercurial force of nature — superlative load to contend with, lynch-pin in their vertical game, and one of the best target strikers in recent years. Griezmann: Talisman in attack — versatile and dynamic forward who makes the most of his touches, and is fairly efficient — also very hardworking and tactically disciplined for an attacker of his profile. Koke: Playmaker in chief, frequently drifting inwards from the outside midfielder station — sound passing ability, good crosses and a difference maker from set pieces. Gabi: The embodiment of the heart and soul of the team — stout defensive screen, goes both ways and is frequently an asset on the ball to keep things ticking over. Primarily built around the trio of Rummenigge (attacking star), Charlton (creative reference point in midfield), Figueroa (defensive leader) — reflecting the stature of Griezmann, Koke, Godín in the team — with Voronin/Gabi as the influential 4th wheel in central midfield. Henry is hard to improve on but keep his style of play. The best option I could think is Baggio although you could keep Henry. Zico for Bergkamp might not be too obvious (I considered Kopa) a direct 10 who can also score and is closest to a second striker than the elite creative central forwards. Pires was a wide playmaker so Rivelino fits nicely. The rest of the side is pretty straight forward. A bit too GOAT-y. Like the OP approach of replacing the world class players with GOATs and support level players with tier 2/3. @Invictus Very good effort. I just don‘t see it with Rummenigge and Griezmann. Griezmann never played on the wing after Sociedad, and he lacks in 1v1 qualities. Why not a proper second striker there? 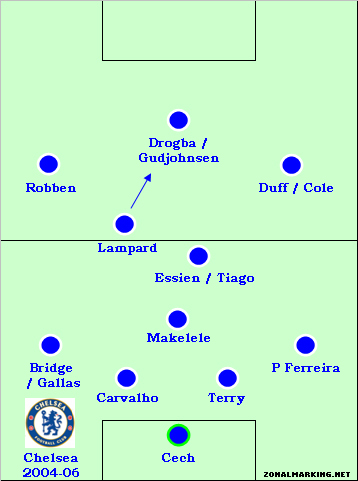 My thinking here is the stars of the side were Bergkamp, Henry and Vieira. Love the Brady shout there @Physiocrat. Luigi Riva is a nice Henry shout I think with his combination of finishing, running with the ball and fluidity on the left. Yeah, I wasn't entirely pleased with that resolution, either — gut instinct said Law or Raúl, but they were a tier or two below Figueroa and Charlton — which would be odd considering Griezmann is a greater player than Koke, so hurriedly decided to post Rummenigge to kickstart the discussion. Still trying to think of the ideal replacement. On to Mourinho's Porto now that @idmanager's done Inter! Deco and Carvalho are the designated superstars — with everyone else ranging from 1-3 tiers below in roles of varying importance (Maniche the tenacious shuttler, McCarthy scoring at a good rate, Ferreira delivering some of the best performances of his career on the right flank, Costinha and Mendes organizing the midfield, Costa the hammer to Carvalho's scalpel). 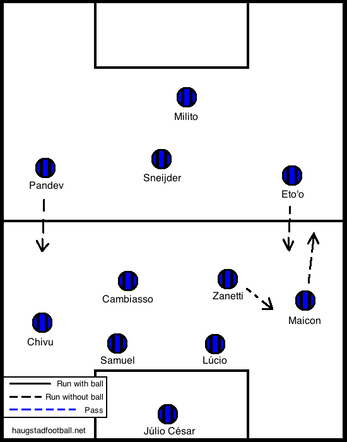 On to Mourinho's Porto now that @idmanager's done Inter, Deco and Carvalho are the designated superstars — with everyone else ranging from 1-3 tiers below in roles of varying importance (Maniche the tenacious shuttler, McCarthy scoring at a good rate, Ferreira delivering some of the best performances of his career on the right flank, Costinha and Mendes organizing the midfield, Costa the hammer to Carvalho's scalpel). Campbell as csrvalho is a great choice, not sure about moore as Costa though. Think it is the other way around.. Moore as Carvalho and Campbell as Costa? Yep, Moore for Carvalho (technically proficient centerback) and Campbell for Costa (tall and robust). The combination kinda mirrors Moore and Jack Charlton for the English national team. Something like that, perhaps. Switched CBs though — Passarella is Lucio's replacement. I really like the Rivera deco pick. 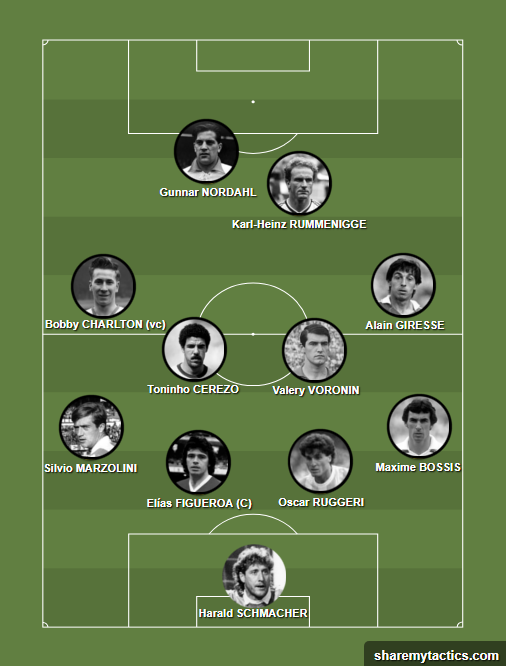 I wojld have briegel instead of bonhof but otherwise great team. That's terrific, @harms — had a bunch of those exact players in mind for my version! Müller for Milito is really apt considering his heroics vs. Roma, Siena, Barcelona and Bayern through the final stretch. 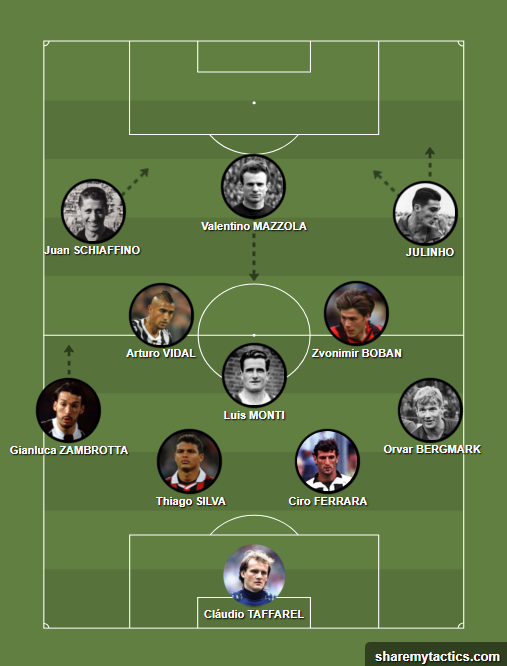 Time for a fresh batch — including Capello's Juventus, who were comparable to mid 2000s Milan but don't receive commensurate acclaim given their inability to conquer Europe, and Spaletti's Roma — with Totti ushering in the new False 9 era (hope Cruyff isn't used there, he has his own thread in this sub-forum). - Pack the side with enormous workrate. - Players who can hold the fort against the biggest storms. - Players used to playing in defensive/counter attacking formations. - For GOATs I chose Lucio, Sneijder and Milito and Cambiasso just below. Caeser <--> Dasayev: Great shot stopper and elite at starting counters. Chivu <--> V. Andrade: Disciplined defensive presence who can tuck in with the CBs to tighten the back. Samuel <--> McGrath: Another name who has history of singlehandedly containing massive attacking threats. Pacy, Athletic, complete defender. Lucio <--> Daniel Passarella: Slots in as the leader of defense, against never say die mentality and critical in moving forward for blocks or starting attacks. Maicon <--> Manfred Kaltz: Important in providing width having great stamina and offensive ability. Someone who can penetrate the opposition defense. Zanetti <--> J. Andrade: I don't think you can upgrade Pupi in this team. Closest stylistically is Andrade, another versatile and complete midfielder/defender. 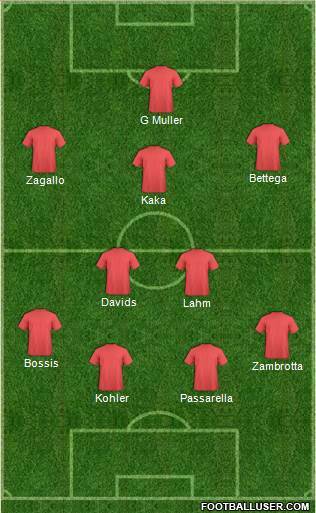 Cambiasso <--> Schweinsteiger: Cambiasso was critical in both phases of play, provided endless stamina and workrate. Sneijder <--> Platini: Straight forward, need a faultless playmaker who can make every attack count, Platini well versed in playing in defensive formations. Pandev <--> Kempes: Super work rate, capable of fortifying the team further, has been used in direct attacks and will make in-roads from that side. Eto'o <--> Lato: Very tough, a combination of goals, pace, work rate and versatility. This is Lato's 74 goal scoring version. Milito <--> van Basten: Apart from the obvious qualities, will bring the wing forwards and Platini into the game, and them being scorers. First name that came to mind for this team. Yeah, considered him as well. 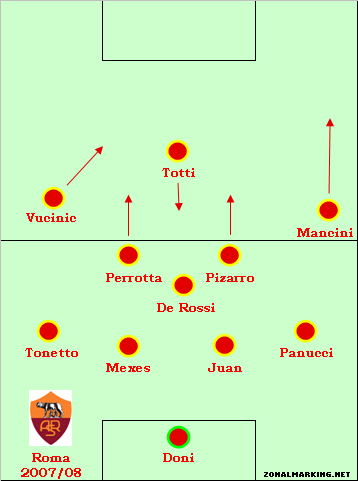 Extra points for anyone who uses Sarosi for the Totti role in Spaletti's side. Some lovely Roma remakes, thus far (including @idmanager's with Dr. Sárosi)! Going for the original Mourinho Chelsea side. Star players probably Drogba, Lampard and Carvalho. Not a fan of him in the false 9 role though. He was way more a midfielder rather than a foward even though he scored prolificly. 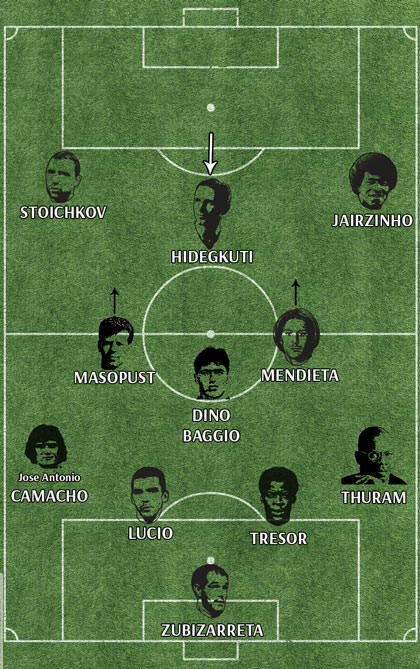 Sindelar, Sarosi and Hidegkuti from back then would be my favorites to replace Totti. Well it won't be the first time Ive had to block you on a social forum. But not yet. Meazza is known to be flexible enough for every attacking position, but I remember reading a post in a draft thread where it was dissected how Meazza scored much more in one specific and his goalscoring numbers dropped when used in other positions. I have searched for the post but have never found it again. Do you (or anyone else) remember that? Sure, based on what I have read, at Inter he started off as a striker and then moved to the Left wing forward / inside left positions. Was really prolific and scored almost 2 in 3 games for Inter Milan. For the national team in the WC's though, he very rarely started at that position. In the world cups, he played in the inside forward role and played it spectacularly. But it did impact his goals outcome. Scored only 3 in 9 games in the 2 WC combined with 1 being a penalty and one a set piece. You can see the difference in his scoring rates before and after in general. He was right footed so you imagine why he would have scored more goals as a left forward. He hardly ever played as a pure striker though except for his teen years. His assists tally of course was always amazing for Italy at the WC's as he was the main creator along with Ferrari through whom everything went. He won the golden ball at the WC not for his goals from the right but for his play making skills. Again only based on what I have read, he did like to drift wide from time to time but that was mostly left sided. I don't have any links handy right now though.